Meet & Greet Joins Up With "Ride For A Warrior Dice Ride and Raffle"
"Ride For A Warrior Dice Ride and Raffle"
November 12, 2017 10 ??? AM - ? The 2017 Washington State legislature has finally adjourned after their third special session this year in a failed attempt to resolve budget legislation. At the end of June they passed operating legislation that keeps the increases to previously appropriated Nonhighway and Offroad Activities (NOVA) funding in place, but failed to enact future capital appropriations. This directly impacts our NOVA funding going forward, we will continue to watch this closely. Since this legislative failure impacts far more than just our sport it will eventually get resolved. 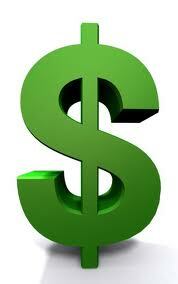 That said, we must stay vigilant in protecting the $14 million of our NOVA fund allocations potentially at risk. 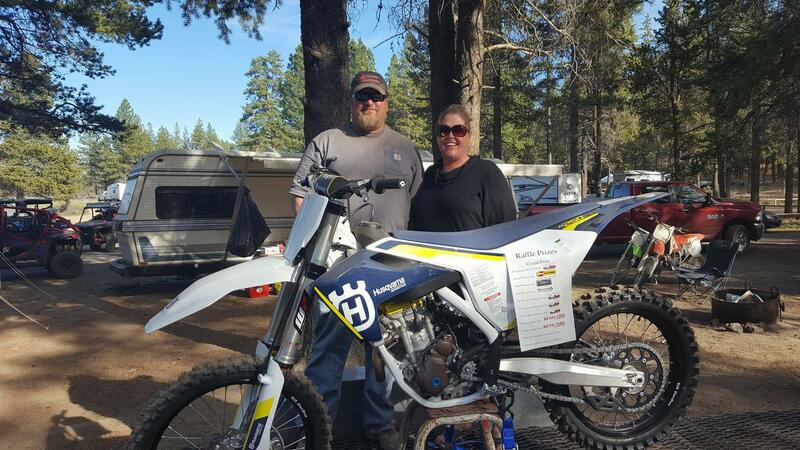 Other than that open issue, we had some small victories, a few good things that came up short and no specifically anti-OHV legislation was attempted this year. WOHVA led the way in getting Senate Bill 5200 (SB5200) passed. This bill was sponsored by Senator Randi Becker and will allow spouses to pool their volunteer hours for the purpose of earning a free Discover Pass. We helped successfully pass House Bill 1838 (HB1838). This corrected a flaw in the original WATV road use law and will allow WATV to legally cross certain roads where they could not legally cross in the past. This OHV positive bill was sponsored by Representative Joe Schmick. WOHVA actively opposed unsuccessful House Bill 1286 (HB1286) due the disproportionately large portion of the cost burden it would impose on the purchasers of ORV permits due to increased service fees. On the WATV road use front, House Bill 1156 (HB1156) would have expanded the WATV road use county population threshold from 15k to 300k. This would have broadened it out to all but the five largest counties. Unfortunately it stood zero chance of passing due to solid opposition by House Transportation Committee Chairman, Representative Judy Clibborn. House Bill 1307 (HB1307) would have allowed local jurisdictions to establish different speed limits for different vehicle types. This would facilitate opening some roads with speed limits over 35 mph to WATV use at a slower speed limit, but it also died in Representative Clibborn's committee. Once again WOHVA drafted new landowner liability protection legislation, but once again could not overcome opposition by the trial lawyer's association. The Washington State Motorsport Dealers Association (WSMSDA) championed the passage of Senate Bill 5338 (SB5338). This will make it a gross misdemeanor for a resident of WA to register an ORV or snowmobile in another state for the purpose of evading WA state registration fees. They believe Washington State is losing out on a large amount of ORV funding due to people illegally registering their vehicles out of state. A number of bills failed that would have created a "carbon" or "fossil fuel" tax. All of these bills would have added a new tax on motor vehicle fuel, varying from 14 to 23 cents a gallons with provisions to automatically go up in the future. The money would have gone to a variety of uses, including education. Since Article II, Section 40 of the Washington State Constitution prohibits money from motor vehicle fuel taxes from being used for non-road purposes, this appeared to us to be unconstitutional. Keep an eye on the WOHVA Facebook page to stay up to date and learn how you can help us achieve OHV positive legislative outcomes. Also, check our "Legislative of Interest to OHVers" web page to see ALL the legislation that may be of interest of OHVers. For those 275 WOHVA supporters who attended LAST year's Meet & Greet in Ahtanum near Yakima, we have a new plan for 2017 that promises to be "even more rewarding"! This year's ride will take place in the Taneum/Manastash area south of Cle Elum. We're keeping the concept of a joint event for 4x4, ATV/UTV, and dirt bikes but we're joining forces with long-time WOHVA supporter Russ Henry to help disabled veterans as well. Mark your calendars for Sept 15-16th and the opportunity to ride/wheel, camp with live music and win lottery prizes including a new motorcycle! Russ has been hosting events to raise money for disabled veterans for two years now and has fine-tuned them to the delight of all who've attended. He's specifically targeting the funds raised to purchase tracked mobility chairs for vets who otherwise can no longer access the outdoors. 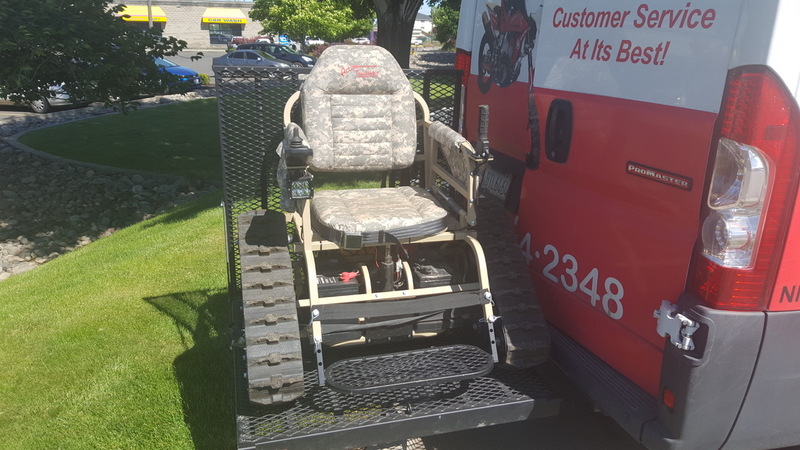 Previous events have been in Bend and Naches and have allowed his charity, "Off Road Riders For Veterans" to donate the first chair to handicapped Marine hero, Al Olsen. 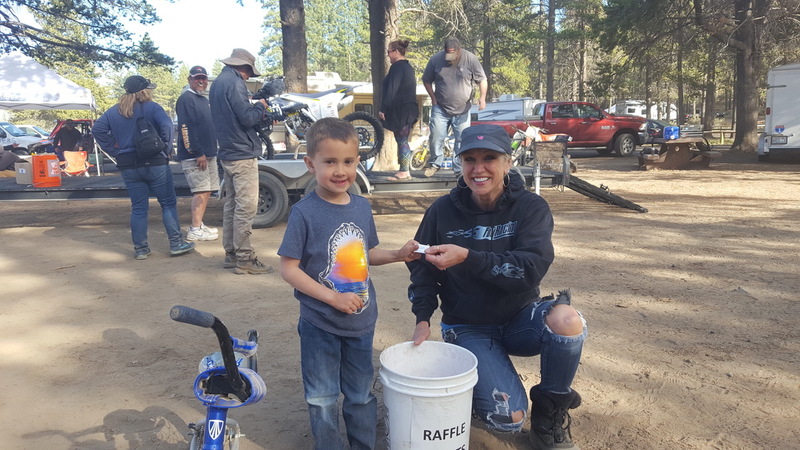 The entry fee structure for this ride is shown at the Off Road Riders For Veterans website and all proceeds will go towards purchasing more track mobility chairs for disabled vets. For that entry fee participants get great food, live entertainment Friday and Saturday night, and a raffle with over $3,000 in prizes and a new motorcycle. For the ride itself, rather than structured rides, there are multiple courses of varying lengths and difficulties with no given start times. There will be 4-wheeled routes and single-track routes. You can ride where you want, when you want, for as long as you want on Saturday and Sunday. When finished riding, you turn in your route card and roll 5 dice to see how many additional raffle tickets you get. As Russ says, "this is NOT a traditional poker run. It lets you be free to ride and you're not pigeonholed into a single constrained trail. And with the smaller attendance at these events, there are fewer bottlenecks like at the traditional poker runs and that's especially great when the conditions are really dry and dusty". There are sponsorship opportunities available - For a $500 donation you, your organization, or a group of you will have one of the routes named in your honor. The course will be marked with signage that has your name/logo. You will be on the promotional video that is going to be made and you will get a copy. Your info will be posted on the website and in the information packet when you sign in and also publicly posted at the event (note: This donation is separate from the entry fees.) For further details on the ride itself as well as sponsorship, please visit the Off Road Riders For Veterans website. Do you work with the Forest Service on OHV issues? Are you confused by the planning processes that no one seems to understand? Would you like to better understand the USFS Planning Process? If you answered yes to any of these questions, there is help for you! In 2012, the USFS updated their planning rule for the first time in 30 years. As part of this updating, the USFS created 2 guides to help understand the planning process. The second part of the first guide covers 17 planning topics. Unfortunately Sustainable Recreation is covered in only three pages. At the end of each section are references where you can view additional information on the topics covered. 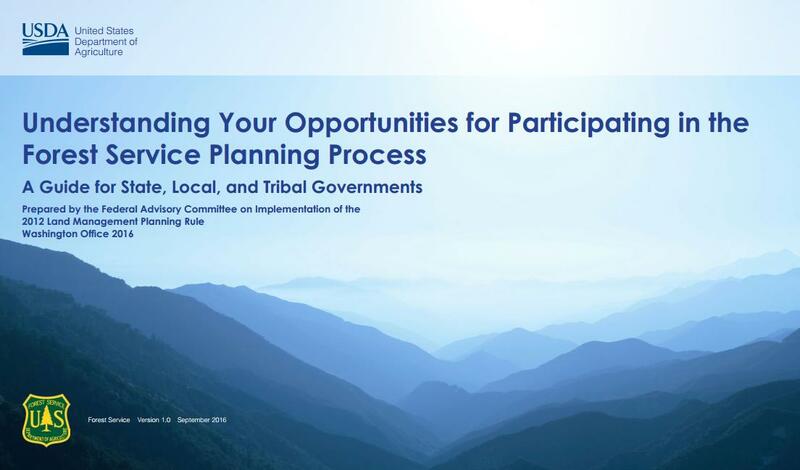 The second guide is titled Understanding Your Opportunities for Participating in the Forest Service Planning Process – A Guide for State, Local, and Tribal Governments. 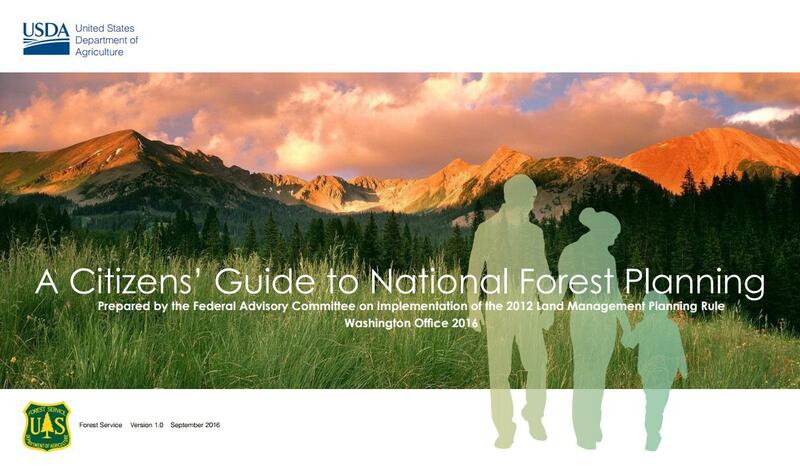 While this guide's primarily target is government entities, it does contain some very useful information individuals can use to further understand the Forest Service Planning Process. This guide is only 22 pages (excluding the sample Memorandum of Understanding contained in the appendix). This guide has some of the same information contained in the first guide in case you don't review both guides. After downloading both guides, I discovered they are set up for 17" wide by 11" high paper – a size most home printers cannot print. I was successful in printing them on 11" x 8.5" paper using a 57.5% reduction. The type is a bit small for my eyes, but I think most people will be able to read them with minimal problems. One word of caution about printing these guides using your home printer: Both guides consumed one color cartridge. I think much of that had to do with the fact the guides have a lot of text with shaded/gradient backgrounds. 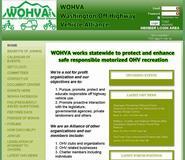 Or you can download them from our "Resources Page" at wohva.org/Resources_Page#USFS_Documents_of_Interest_to_OHVers. This article updates the e-mail recently sent via our Yahoo Groups. Do you like a simple and easy to remember web addresses? So do we! Recently we upgraded our website to include a security certificate that ensures that when you connect to our website, you can be assured our website IS secure and the likelihood of it being hacked in minimized. So what is our web address? It is wohva.org. There is no need to preface it with http, https, or www. If you use only wohva.org you should not encounter any errors or security warnings and your browser will know exactly where to go. Always use only wohva.org if you want to send someone to our home page. If you want someone to go to a particular page (not recommended), add the page URL to wohva.org so it would look like www.wohva.org/(specific page). This is not recommended because we plan on updating our website in the future to make it more mobile device friendly and the page names WILL LIKELY change. Please update ALL your bookmarks/favorites/links and anywhere else wohva.org is used to ensure you keep it short and simple! If you have any questions, you can always contact the webmaster at webmaster@wohva.org. See something here that interests you? Did we strike a resonant chord? WOHVA is a 100% volunteer-led effort. Your efforts make a big difference. Please send an e-mail to info@wohva.org to let us know how you'd like to help.